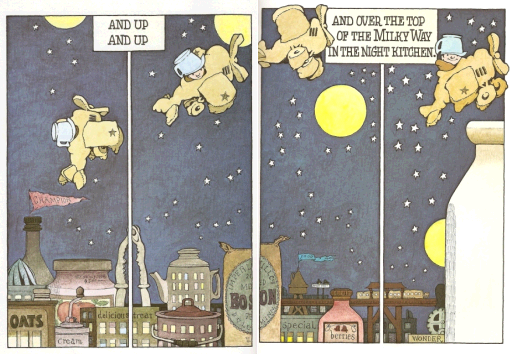 Welcome to installment three of the Absurdly In-Depth Analysis of In the Night Kitchen, by Maurice Sendak. See parts 1 (here) and 2(here) to catch up. Up until this point, there has already been a complete, if unsubstantive, plot arc. We have seen Mickey fall away from home, be baked in a cake, and achieve ultimate redemption by using dough, that sticky morass of potential danger, to escape dough. Fine, book’s over. Time to sleep. More conflict lies ahead. I confess myself essentially baffled by this page. I don’t know why the cooks need milk, or why Mickey is a stand-in for milk throughout the book. I don’t know whether Mickey is unfairly depriving them of something important, or if the cooks are unjustly demanding something Mickey cannot give. I don’t know if Mickey has milk or is milk, or if the cooks are just confused. Most of all, I’m intrigued by what kind of cake they’re making. Most cakes don’t have milk. Cupcakes do. Coffee cake does, which makes sense as a morning cake. I know this seems silly, but I actually wonder whether the readers are supposed to imagine the cake as potentially existing, whether the cake is a plot point, an unachievable goal, or an important and present character. Somehow I think that the abstractness and unspecified notion of morning cake, something delicious to wake you up, is the important bit here, so apologies for the foodie detour. Now we have more information. Mickey isn’t the milk, but he has access to it. The cooks’ faces have turned from fearful and demanding to curious and patient. The first two, at least, in the first panel, seem to be amused by Mickey’s antics. They might even be said to believe in him, to expect that he will succeed, but certainly no more than Mickey himself, who is more and more finding his way. He has an identity now, as pilot, and a set of skills that are so a part of himself that they are named after him. There is a Mickey way to get milk, of course! The sheer confidence, combined with the delightfully proud look on his face, give all the child readers a similar sense of bravado, thinking that in their imagined worlds, in their Night Kitchens, they, too, will be able to take charge and become the center of importance. Note also the difference between the Mickey oven and the Mickey way. While the oven was delightful because it was set aside for Mickey before he even knew it was there, it was not of his own creation. It is a relic of the earlier Night Kitchen, one that Mickey was experiencing but not acting on. The Mickey way is both more Mickey’s because he invented it, and also because it is more abstract; it exists only in his head and cannot be taken from him. So he takes the cup, adorns his head with it (thereby giving himself the status of the chefs, whose hats look similar) and flies off, completely ignoring the cook who uselessly points in the direction that Mickey knows very well already. How beautiful the Night Kitchen is. Is it not? A land of Oats and Delicious Treats and stars and stars and an exquisitely large moon. It is also a land in which you can fly straight up, as we have all longed to do, to move in the direction our eyes see, without adjustment for such ignoble things as gravity. The first panel is idealism, the path upwards. The next two are skill, Mickey’s care in making sure the plane is going exactly where he intends, with concentration and determination. The final one is success, with that adorable grin, Mickey has surely completed the task he set for himself. That trajectory is a seductive one, one that I as a child was certainly enthralled by. What would it be to fly in impossible ways, with impossible skill and achieve my dreams? To have an entire world look on in delight and amazement as I complete a task not thought possible? To change occupations at will? 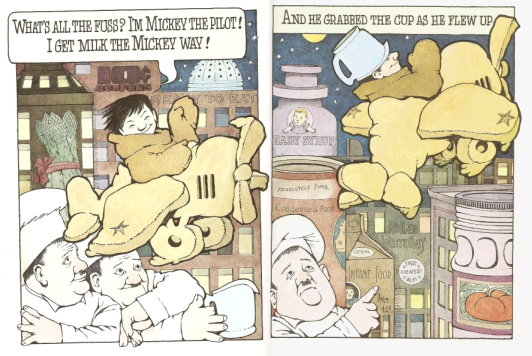 Mickey was a boy, then mistaken for milk, then wrapped in dough, then a pilot, and now a milkman. And why not? Why should he not be whatever he wants to be, or as the protagonist of his own story, whatever the current circumstances call him to be? Less abstractly, I remember thinking how delightful it would be to swim in a giant jar of milk, even though the emotional resonances for me must be less powerful, having grown up with milk from a carton from the supermarket rather than delivered in jars by milkmen. I love how as he changes occupations he changes tool sets, leaving his beautiful plane up top as he takes his cup in hand and goes to work. Best yet, he is singing, reminding me, the young reader, just how much fun he’s having in that milk jar, forcing me to imagine being in that jar and thus being in that fantasy kitchen of massive proportions. That song, too, is important. I don’t know if it’s a Jewish thing or not, but I distinctly recall learning Jim Brickman’s I See the Moon(I didn’t know the provenience until I looked it up just now) at Jewish summer camp. The lyrics make for a beautiful bedtime song and include the line, “I see the moon, the moon sees me, and the moon sees somebody I want to see. So, God bless the moon and God bless me and God bless the Somebody I want to see” so very clearly similar to the line in the book. The moon, then, comes back into prominence, but I’m not sure what further connections there might be. Also, Mickey is naked again. Seemed worth pointing out. The next installment will finish the book! P.S. Don’t you love how the drawings go outside the page? This entry was posted in books and tagged authors, childhood.